How many studies need to be done on the laying of turf at the National Stadium in Bukit Jalil to end the never-ending woes of poor surface since the stadium as opened in 1998? The stadium was closed for six months for the laying of Bermuda Princess 77 turf at a cost of RM1.5 million and was used for the Malaysia Cup final last Saturday. 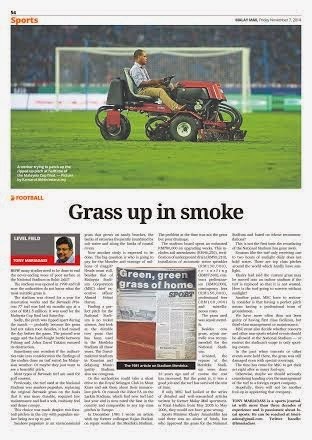 Sadly, the pitch was literally ripped apart during the match probably because the grass had not taken root yet. Besides, it had rained the whole day before the game. The ground was soggy and the hard-fought battle between Pahang and Johor Darul Takzim ensured its destruction. Sometimes one wonders if the authorities take into consideration the findings of the studies done on turf suited for Malaysian weather. Or maybe they just want to see a beautiful pitch, which, when played on, turns into a nightmare. From what I know, most types of Bermuda turf are usually used for golf courses. Previously, the turf used at the National Stadium was seashore paspalum, replacing the original Bermuda grass on the basis that it was more durable, required low maintenance and had a soft, cushiony feel and dense canopy. This choice was made despite two football pitches in the city with paspalum surface that were not exactly perfect. Seashore paspalum is an environmental grass that grows on sandy beaches, the banks of estuaries frequently inundated by salt water and along the banks of coastal rivers. Coming back to Bermuda Princess 77, another study is expected to be done. The big question is, who is going to pay for the blunder and wastage of millions of ringgit? Heads must roll, besides that of Malaysia Stadium Corporation (MSC) chief executive officer Ahmad Helmi Harun. Finding a perfect pitch for the National Stadium is no rocket science. Just look at the durable cow grass that has been used in the Merdeka Stadium all these years and other stadiums like the Darulmakmur in Kuantan and Selayang Municipality Stadium who have opted for cowgrass. Or the authorities could take a short drive to the Royal Selangor Club in Mont Kiara and ask them about their immaculate pitch. Or consult the Johor FA on the Larkin Stadium, which had new turf laid last year and is now rated the best in the country and comparable to any top-class pitch in Europe. I remember way back in December 1981 when I wrote an article with colleague Rajan Etickan on repair works at the Merdeka Stadium. The problem at the time was not the grass but poor drainage. The stadium board spent only RM780,000 on soil amendment (RM46,250), rectification of underground drain (RM93,210), installation of automatic water sprinkler ((RM130,000), re-turfing (RM87,600), contract preliminaries (RM30,000), contingency fees (RM150,000) and professional fees (RM100,000). The grass used then was zoysia metrella. In fact, besides cow grass, zoysia metrella was recommended for the National Stadium. According to Ahmad Helmi, who has admitted to having erred on the selection of Bermuda Princess 77, the latter grass is one of the options they are looking at. Granted, the repairs at the Merdeka Stadium were done 33 years ago and of course the cost has increased. But the point is, it was a good job and the turf has survived the test of time. If only MSC had looked at the series of detailed and well-researched articles written by former Malay Mail sportswriter Rizal Hashim from May 2005 to May 2006, they would not have gone wrong. Sports Minister Khairy Jamaluddin has said there was no abuse of funds in the upgrading and re-turfing of the National Stadium. If that is the case, then who approved the turf and based on whose recommendations? This is not the first time the resurfacing of the National Stadium has gone awry. Everyone involved in the mess needs to be held accountable because huge sums of money have gone up in smoke. Reasons like the turf at Bukit Jalil only receives one to two hours of sunlight daily and they had to use ‘grow lights and blowers’ does not hold water. There are top class pitches around the world who hardly have sunlight or adverse weather conditions. But Khairy had also said that the current grass may be moved into an indoor if the turf is replaced so that it is not wasted. Now wondering how the turf is going to survive without sunlight? So it is just money wasted because of a wrong decision? Another point, MSC have to seriously consider is that having a perfect pitch means having a professional team of groundsmen. We have more often than not been guilty of having first class facilities, but third-class management or maintenance. Funds are also not budgeted and allocation for maintenance. Another area the Stadium management have to make a bold decision is whether concerts and other non-sports relate events be allowed to be held at the National Stadium. Maybe, it is about time to have the National Stadium specially dedicated only for sports and have concerts and other events in indoor stadiums. In the past we have seen the National Stadium used for concerts special coverings are used for the grass, but the pitch was still affected. This was because the coverings were not removed quickly enough by the time they were removed, the grass had turned yellow and will have little time to recover. These areas then turned into bald patches. The blame was put on the organisers of such events as they were the ones responsible for removing the covering. But the time has come for Malaysia Stadium Corporation to get their act right once and for all after so many foul-ups. Otherwise, maybe the time has come to seriously considering giving the management of the turf to a foreign expert company with a good record. Hopefully, there will not be another foul-up in appointing the company.